it is 8:05 on a monday night. Just about 30 days until ArtWalk. I should be foiling, not typing. But I’m a tad burned out on glass at this very moment. the Northern Light v2 is turning out magnificently. I am going to have some trouble resisting the urge to keep it, and selling v1. The teal and purple in the aurora borealis are deeper tones in this version. Only time will tell if that was a good choice. i enlarged the pattern and decided to set the tree off center. I added some grey to the snow and changed the shape of it a bit. Remembering what a bugger the corduroy glass was to foil and clean, I opted to use nubbly glass for the tree trunk. i did make one kind huge mistake, but i am not going to share it with you, lol, it will be my little secret. and I am the only one who will think it is a mistake anyway. probably. 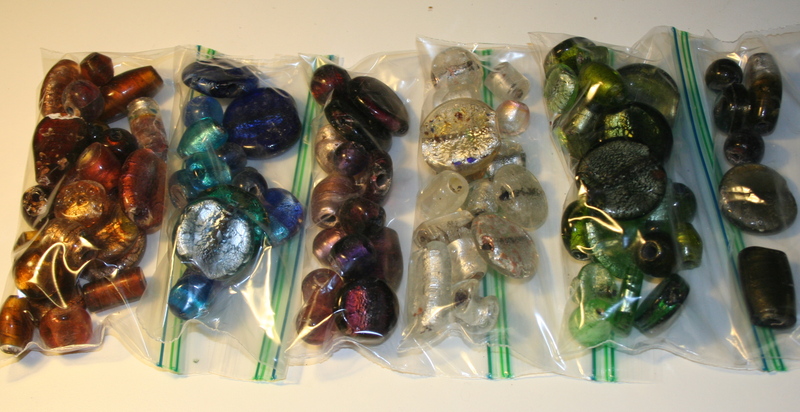 I have been trolling ebay and etsy looking for those beads for the fish piece. to finish off the lures. to my surprise, i found them. it took about an hour, and it wasn’t until i lucked out and found the correct wording to describe them. I found a lady selling a lb of them for $3. three dollars! I was paying .75 cents a piece at beadman. and the ones that i bought from beadman last time are rejects… the holes aren’t drilled all the way through so they are useless for my purposes. Its a gorgeous mix of colors. I mostly use the cool tones but since there are so many oranges, I might have to make an orange-themed version. very very pleased with the find. ~ by kellig on October 4, 2011.